As a member of your local food co-op, you know the difference that co-ops make in your community. And as part of our celebrations of the Co-op Decade, the Neighboring Food Co-op Association is profiling other co-operative businesses that are building a thriving regional economy. For many small business owners, what gets them up in the morning is not just creating a successful company. Success is also about creating lasting social, economic and environmental value in the world by providing good jobs, offering quality products and services, and giving back to community. But one of the challenges to the sustainability of small business is succession. As owners look toward retirement or new opportunities, they may wonder what their options are. Others may want to stay in their business but realize that they find it more fulfilling to share the rewards and responsibilities of running their enterprise. In both of these cases, a transition to the worker co-op model can be an effective and rewarding way forward. By engaging employees in the ownership and operation of the business over time, a small business owner has the pleasure of knowing that their work will continue in the community. And workers have the opportunity to become owners and entrepreneurs–or in this case “co-opreneurs”–in their business. Back in 1981, four people founded the Green Mountain Spinnery in Putney, VT, with the goals of supporting regional sheep farmers and producing natural wool products for local artisans in the most environmentally sound manner possible. The founders were inspired by E.F. Schumacher’s Small is Beautiful, and shared the author’s vision of community-based enterprise. After twenty-five successful years of operation, the owners began to think about how to ensure that the work they had started would continue. They worked with the Vermont Employee Ownership Center (VEOC) to obtain a grant to transition the business to co-operative ownership. Today, the Green Mountain Spinnery Co-op is owned by nine members and has recently published an updated edition of its book of knitting designs, 99 Yarns and Counting: More Designs from the Green Mountain Spinnery Cooperative. The Spinnery provides good manufacturing jobs, health benefits and flexible schedules that encourage members to be more involved in their communities, whether that means coaching sports or serving on the board of a community organization. The co-op also contributes to local community organizations and events such as Brattleboro’s “Strolling of the Heifers,” and sponsors a knitting circle for elders in Putney. 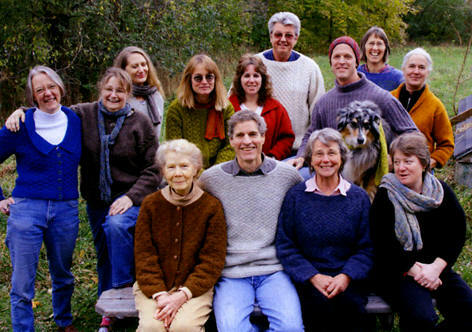 Next time you’re in southern Vermont, be sure to stop by the Spinnery, or visit them on the web: www.spinnery.com. Erbin Crowell is Executive Director for the Neighboring Food Co-op Association, www.nfca.coop, and serves on the Board of Directors for the Cooperative Fund of New England, www.coopfund.coop.